The Western & Atlantic Railroad was the rail line on which the Great Locomotive Chase took place. Leased by the NC&StL, then the L&N, now the CSX. The State of Georgia owns the road. 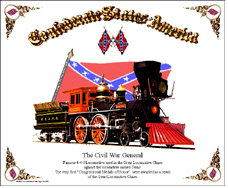 6 inch x 6 inch square tin logo sign of the Civil War era Western & Atlantic Railroads battle fields logo used to advertise its scenic line through Civil War Battle Fields, the road on which The Great Locomotive Chase occured. This coffee mug features an old image used by the Western & Atlantic Railroad to promote its Battle Fields Line through Chattnooga, Atlanta and Kennesaw. Mug also has a small image of the General, famous for the W&A's Civil War Great Locomotive Chase.